After the announcement of Japanese clinical study results (Phase 2) of OCA in NASH, it is appropriate to wonder about the real future of this drug candidate in NASH. Since January 2014, INTERCEPT was considered as the best positioned biotechnology company by the market for the future treatment of NASH. Their Phase 2b study named FLINT with duration of 72 weeks including 283 patients originally in two balanced arms, a Placebo and one OCA (24 mg / daily) orally. INTERCEPT was not the sponsor of this study, which had been delegated to the National Institute of Diabetes and Digestive and Kidney Diseases (NIDDK). In early January 2014, Intercept announced that the NIDDK had decided to discontinue the study, due to positive interim results allowing to reach the first endpoint of the study. This announcement was followed by intense speculation and the Intercept stock price rose from $ 70 to over $ 400 in two days. « … all patient[s] who remain on treatment (OCA or Placebo) will be discontinued within two weeks of today ». 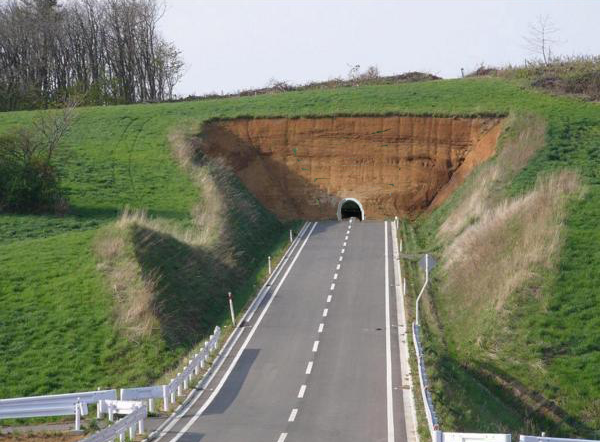 which could reveal, in their mind, a potential risk in pursuing the study. This announcement has distorted the information given to the public. As soon as the truth came out, the stock value quickly lost almost 40% of its value. Following, shareholders, feeling cheated by an oriented communication, sued the company in a Class Action. INTERCEPT wanted to oppose this action, but a judge has confirmed, on the evidences he's got, that the class action is justified. The memorandum of his judgment is a wealth of information. We learned, shortly after, that the publication of the study was initially refused by the New England Journal of Medicine on grounds of lack of scientific rigor, partly for non-centralized reading of histological liver biopsies. NEJM would not accept the FLINT data for publication because Intercept published the early findings of the DSMB, said a person familiar. The trial suffered from a loss of power due to its early stop, which is something thatnobody wants to talk about, said a second person familiar. However, publication of the interim results was not the only reason the paper was rejected by NEJM, said the source familiar. The NEJM reviews did not like the fact thatthere were discrepancies between the liver biopsy pathologyassessments at the central lab versus the local labs, the source added. The study, due to its early termination, had to separate the patients who had not finished treatment and had not practiced the second control biopsy. Therefore, the results were based on only 200 patients vs initial 283, which makes 29% of the patients had to be excluded and that in fact only 71% of the initial sample was ultimately taken into account. and incidentally a noticeable or significant pruritus in 23% of the patients. A Post Hoc study, which only few data were transmitted uppon, and not published in a scientific journal, revealed that 20% of FLINT’s patients supposed to have NASH at baseline and had no NASH at all. It also revealed that 26 patients had started additional treatment with statins DURING the study .. Some independant researchers also asked about the documents published in the Lancet. One of the issues highlighted, always on the basis of data published in the Lancet, that OCA seemed to have no statistically significant effect on non-diabetic patients, limiting its scope. The responses were unfortunately made on the basis of unpublished data. To my opinion based from the information that followed, these findings appear fragile, as many biases in the study, some incredible, were identified. - The non-centralized reading of biopsies which is a well recognized bias. - The absence of stabilization of other drugs acting on the disease (Vitamin E, statins) before and during the clinical study. - The study in only 8 centers and only one country (USA). 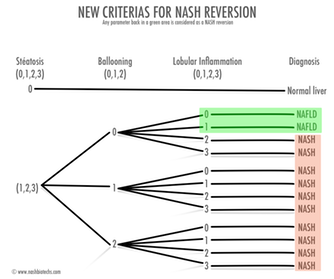 - The finding 'a posteriori' that 20% of patients enrolled had no NASH. These last two points would, by themselves, justify a complete new publication by spreading the 40 patients without NASH and 26 patients started treatment with statins and recalculating the overall results. Given their tendency to highlight all the positives in their communications, is not a good sign. We can, with little chance of being wrong, imagine that, on this sample cleared of the 66 patients who had not respected the protocol, the results are not there, otherwise they would have been published. But now the partial results of another Phase 2 study for the OCA in NASH in Japan (JapicCTI-121993) have just fallen. The study had a slightly different design from that of the FLINT study including 200 patients and having four arms (placebo, 10 mg / day, a 20 mg / day, a 40 mg / day). What makes a sample of 50 patients per arm, which is far from being ridiculous and unimportant as we have read, the ongoing Phase 2 studies in NASH comprise only 19 patients per arm. Results presented as irrelevant by the company are bad. Indeed, 10 mg and 20 mg arm did not reach, by far, the target criterion declining NAS score by two points. The 40 mg arm attained item from very little, its p value is 0.0496 when the upper limit of statistical significance is set at 0.05! and this at the cost of abandoning 26% of the patients under study, 10% because of the itching that affected at various levels 50% of patients. Bad habits are not lost, the rate of very unfavorable pruritus was not published in the press release of INTERCEPT, and we had go get in Sumitomo’s one, Sumitomo is INTERCEPT's Japanese partner. Furthermore no evidence was provided on changes in lipid profile, they were nevertheless very expected. The only information provided is that it is consistent with those observed in the FLINT study. Again, the habit of INTERCEPT is to highlight all the positives in their communications. this is not a good sign because it means they are probably the worst for the 40 mg dose. Another extremely negative result is the complete lack of results in the improvement of fibrosis on all arms, or it is on this supposed improvement of fibrosis in NASH that INTERCEPT got Breakthrough Therapy status by FDA. We can reject the argument of the small sample size of the Japanese study that would have affected the reading of the results, because, if we consider the whole sample treated with the OCA in Japan, one gets 150 patients, 50% more than in FLINT ..
And despite this larger sample .. NO SIGNIFICANT IMPROVEMENT IN FIBROSIS ... the argument does not hold. Although the 10 mg arm excluded because of its light dose, the 20mg arm remains very close to FLINT’s one with 24 mg, and the arm 40 mg is more heavily dosed. And again, despite this equivalent sample and a higher average dose, STILL NO IMPROVEMENT OF FIBROSIS ?? I expressed a few months ago my strong doubts about the validity of these results on Fibrosis in the FLINT study, given the rate of error in reading biopsies recognized by INTERCEPT, and when we know that the fibrosis score is completely dependent on this reading. Statistic weak results of the FLINT study left strong doubts about the effectiveness of the OCA in NASH and fibrosis. To my opinion, the Japanese study leaves no doubt. Remember that the primary endpoint of the study was FLINT identical to the study led by Sumitomo, « reducing NAS score by a minimum of two points with no worsening of fibrosis.". With the criterion of phase 2 studies on OCA "drop in NAS score by a minimum of two points with no worsening of fibrosis. », A patient with NASH and with a NAS score of 7 is considered successful if he reaches a score of 5 at the end of the study. 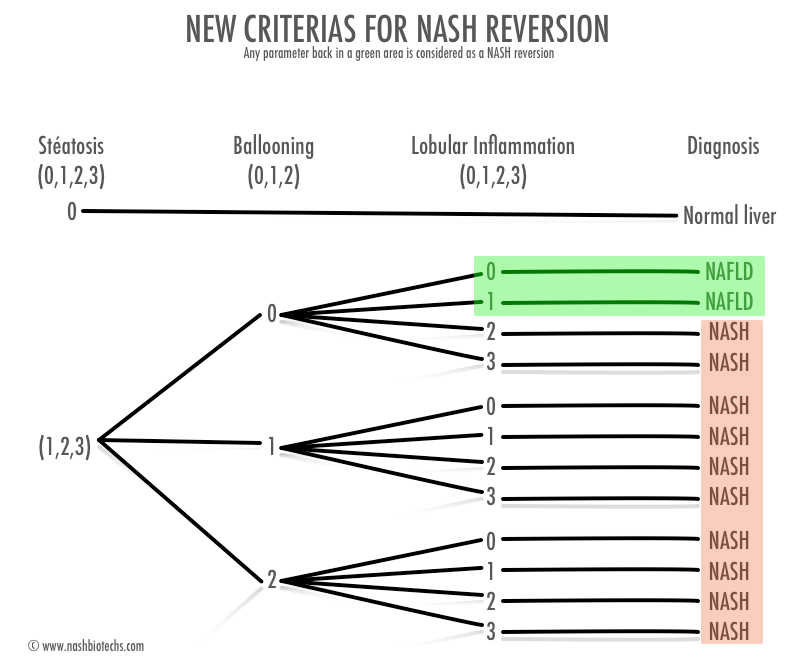 With the criteria now demanded in phase 3, "Reversion of NASH no worsening of fibrosis, » it would require to the patient to reach a NAS score of 2 at the end of the study to be considered a success, which is a drop in NAS score of 5 points. This test was the second criterion of the FLINT study and OCA has never reached it. 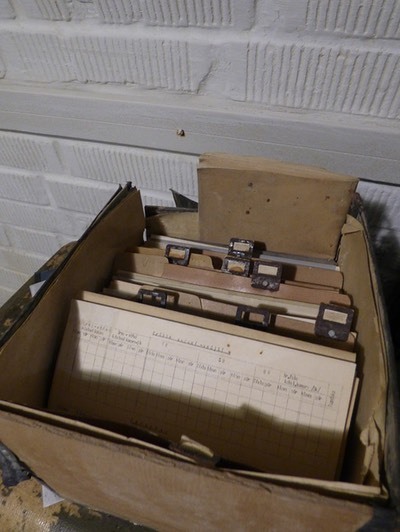 They even cobbled together their score to try to bring it up (see article on this subject). But today we are told a great story telling us that all these biases and failures are not significant and that Phase 3 and its beautiful design will be a success. I spend my professional time trying to imagine the big picture from secondary elements, and here, I don’t believe it. Looking at the latest design published phase 3 "REGENERATE"
The FLINT study involved an arm of 24 mg / day and had been already questioned for its side effects, pruritus, and increased LDL. 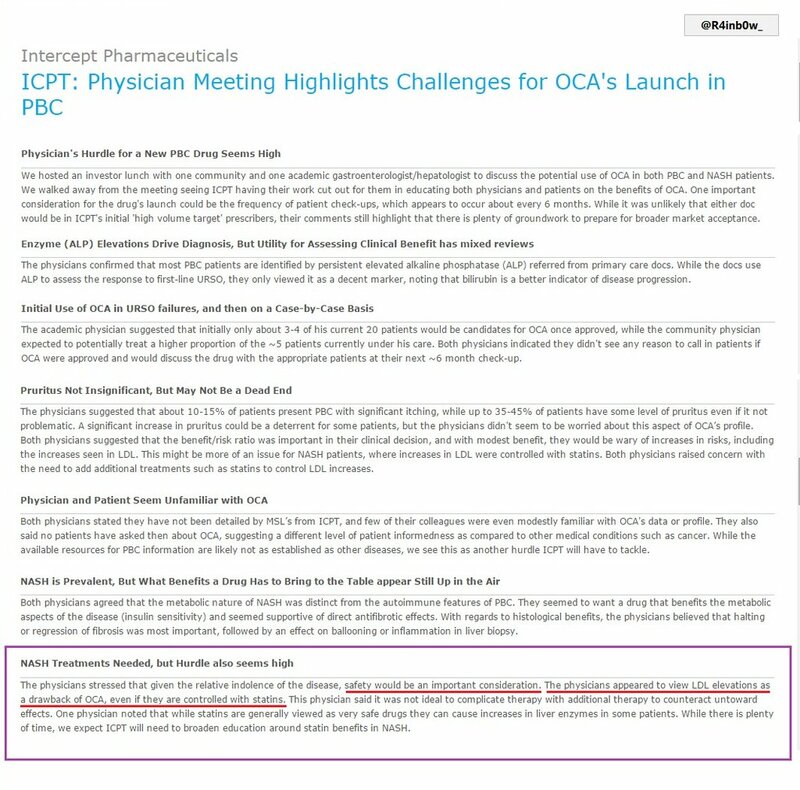 At initial presentation of design, INTERCEPT explained that, based on their studies of the OCA in PBC, they thought that a 10 mg dose was likely to be effective on NASH with less side effects. Now the Japanese study scans the argument brilliantly, the dose effect is now proven on NASH, thus the results already unconvincing of the FLINT study have very little chance of being better or equal with a dose of 10 mg.
Failure even in fibrosis wich is the OCA advantage alleged by Intercept .. the bias we discovered in th FLINT study seems to be confirmed by the Japanese study on OCA .. 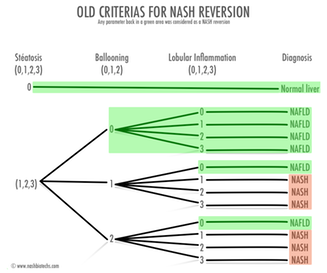 In NASH REVERSION wich is the criteria applied in the future Phase 3 REGENERATE the results are disastrous . FIBROSIS AND REVERSION CRITERIAS ARE THE CRITERIAS SELECTED BY INTERCEPT AS ENDPOINTS IN « REGENERATE » THE STARTING PHASE 3 FOR OCA IN NASH !!! The last point not favorable to INTERCEPT in NASH is the revised new consensual definition of NASH updated at the AASDL meeting in November 2015. This definition is more difficult to reach as its remove the steatosis parameter from the reversion criterias and enhance the impact of the lobular ballooning parameter. Unfortunatly the FLINT study show that OCA impact is strong on steatosis and mild on ballooning. 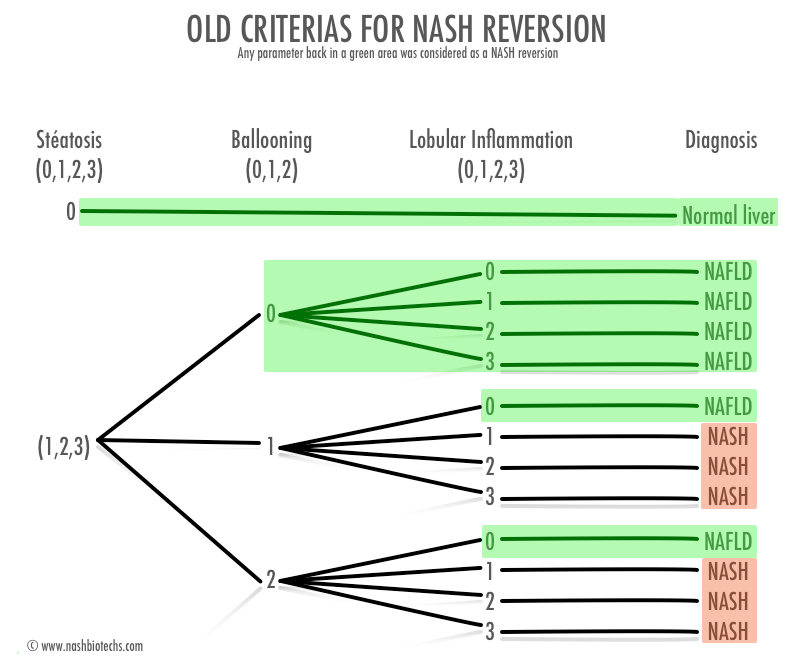 this could jeopardize the expected results on NASH resolution in the future Phase 3. So one wonders why, despite their recent statements, INTERCEPT would spend hundreds of millions of dollars on a study arm that has virtually no chance of a positive result. They would be better off trying an arm with a higher dose, but now, the Japanese study shows an almost unbearable worsening of side effects at higher doses (50% pruritus) totally incompatible with the marketing of a drug for chronic treatment. INTERCEPT finds itself stuck between a rock and a hard place, between the minimum dose to have an effect on NASH, and the maximum acceptable dose to reduce side effects. Before the Japanese study, we could imagine that there was an ideal dosage, located between these two values, which could help market the drug. After the Japanese study, we discover that this interval has never existed. The INTERCEPT leaders are not stupid, and they have the same data, so why would they insist to continue the Phase 3 study with a 10 mg arm as well? They have $ 700 million of cash in the bank and could benefit from further research to launch and grow other products in their pipeline. Despite this, they act as if nothing happened and claim that they will launch their Phase 3 trial as planned without changing the design. My opinion is that INTERCEPT and OCA became a financial product over a potential pharmaceutical blockbuster. You just have to see the number of funds and banks committed to the company to understand. A withdrawal of OCA in NASH, although it would be scientifically logic, at least in the short term, impossible financially speaking. Therefore, despite the bad news that keep coming, the suit in class action, the insiders who have sold over 60% of their shares in the past six months, the financial analysts, paid by funds and banks, support value against all odds and confirm day after day stratospheric potential valuation (15 or $ 20 billion), fully offset with the scientific reality of OCA. We even see the banks as Barclays come on the scientific field. In a press release to their customers, they used some never published scientific explanations to support the value, with arguments, that the company, itself, did not dare to use. The bank issued a statement following the results of the Japanese study, calling them irrelevant, it boggles !! The last in vitro results tempered my jugement, on OCA , those results proof an action, mainly on early stages of NASH, curiously not on collagen synthesis wich is the fibrosis mechanism. OCA could be intersting on NASH in combo, with a PPAR and a pure antfibrotic. Future will tell us if I was right or not, and keep in mind that this is only the opinion of a small shareholder, moreover, a small shareholder of an INTERCEPT’competitor.